The uplifting sounds of Big Country arrived as a welcome breath of trash Celtic air at a time when much of the new wave was camping it up in high fashion or striking various disaffected poses. Big Country bravely bucked fashion with emotional, idealistic lyrics and a strident, anthemic sound as large as the vast expanses summoned by their name. Along with like-minded artists the Alarm, Simple Minds, the Call, and early-period U2, the quartet recalled the genuine excitement and feeling of the best music of the sixties, updated with a straightforward, hard-charging delivery that endeared them to hearts and charts worldwide. They managed to be political without being pedantic, frequently breaking the air with rousing shouts of "schaah!" to keep the excitement level high. Though best known for their uniquely textured, bagpipe-like guitar sound, Big Country was far from being a one-trick pony. From the dense, ringing "East Of Eden" to the spiky "The Teacher" to the signature riffs of their biggest American hit, "In A Big Country," B.C. stands among the finest guitar bands of the eighties, as this compilation ably demonstrates. The group formed in 1981 around vocalist/guitarist Stuart Adamson, former leader of UK punk rockers, the Skids. Disillusioned after that band's breakup, Adamson returned home to Dumfermline, Scotland and formed Big Country with childhood friend, guitarist Bruce Watson. Filling out the initial lineup was Clive Parker and brothers Pete and Adam Wishart. The nascent band attracted the ear of Phonogram Records, which requested demos. On the eve of their recording session, Adamson and Watson ditched Parker and the Wishart brothers, hooking up with studio regulars Tony Butler (bass) and Mark Brzezicki (drums), both veterans of Pete Townshend's solo bands. The revamped lineup proved a powerful combination, marrying the power and passion of punk with the focus and precision of the seasoned studio vets. Signed to Phonogram in the UK, Big Country released their debut single, "Harvest Home," in September, 1982. Introducing their trademark layered guitar sound and evocative lyrics, the Chris Thomas-produced single promptly sold 6,000 copies. The band toured relentlessly and achieved their breakthrough after supporting the Jam's six farewell shows at Wembley Arena in London. Their profile immeasurably raised, the second single "Fields Of Fire (400 Miles)," recorded with producer Steve Lillywhite, provided their Top 10 breakthrough. Their third single, the classic "In A Big Country," cemented their name in the minds of the public and yielded a UK Top 20 success. "In A Big Country" also was their first release in America (on Mercury Records), where it duly hit the Top 20, earning the band Grammy" nominations for Single of the Year and Best New Artist. Their eagerly awaited debut album, 1983's The Crossing, proved to be one of the year's most exciting and successful debut entries. The Crossing went platinum in the UK (spending 80 weeks on the charts), double platinum in Canada, and gold in the U.S., spinning off another British Top 10 single hit in "Chance." With legions of fans eager for more, Big Country prefaced their second album with Wonderland, an E.P. containing several new tunes. Billboard raved, "...the title song may be the most bracing example of the four Scots' ringing, highland rock yet." Two other tracks from the E.P., "All Fall Together" and "The Crossing," make their American CD debuts on this collection. All served to further whet appetites for album number two, Steeltown, which entered the UK charts at #1 in late 1984. Steeltown, while ultimately a commercial letdown after the heights of their debut, nonetheless launched two of Big Country's most effective singles, "East Of Eden" and "Where The Rose Is Sown." consecutive UK Top 30 hit. Following these triumphs, the band split from Mercury Records in America and, several years later, with Phonogram in the UK, going on to record for Reprise and RCA (among others) with varying degrees of success. 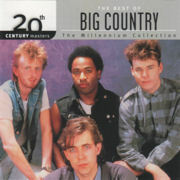 It is fitting that this compilation should be subtitled "The Millennium Collection" as Big Country is one of the few eighties upstarts who have survived into the new millennium with their classic lineup intact. A testament to their unequivocal commitment to music above all else, Stuart Adamson, Bruce Watson, Tony Butler and Mark Brzezicki have continued to record and perform long after their band fell from mainstream fashion. "There's a responsibility to create music that's worthwhile and lasting and invokes a sense of involvement in the real world rather than some fictitious desert island," Adamson told Smash Hits at the height of their mid-eighties success. Throughout a 20-year career, Big Country has never shirked that charge. Record Retailer/Music Week Pop Singles Chart peak position (noted "UK") courtesy of Guinness Publishing Ltd.
umusic.ca Ⓟ © 2001 The Island Def Jam Music Group. All rights reserved. Manufactured and distributed in Canada by universal Music, 2450 Victoria Park Ave., Willowdale, Ontario M2J 4A2. Unauthorized reproduction, copying and rental of this recording is prohibited by law.